Dissolved oxygen concentration from Scanfish transects in early August 2004. The waters in the Northern Gulf of Mexico are strongly influenced by the outflow of the Mississippi River, extensive fishing efforts, mineral exploitation, and civil engineering projects. These factors, coupled with the natural ocean currents and conditions have led to large areas of low oxygen in the deep water on the shelf, offshore of Louisiana and Texas. While it is clear that low oxygen water on the bottom can affect bottom dwelling organisms, it is less clear how these conditions can affect animals that live higher in the water, or pelagic animals. Our work in this region seeks to understand how the pelagic animals, namely fish and animal plankton (zooplankton), are affected and impacted by the presence of low oxygen in the deep water on the shelf. We have conducted a series of surveys of the region to map the environmental conditions as well as the fish and zooplankton distributions in relation to the low oxygen water. In addition we have performed various studies to determine how changes in the distribution of conditions and animals are affected by the day/night cycle and the “edge” of the low oxygen water. Our current focus is on synthesizing this work into a coherent story that can be useful to managers and policy makers. To assess the full impact of hypoxia on living resources of the Northern Gulf of Mexico (NGOMEX) requires a multi-scale (both time and space) and multi-stressor approach. This project proposes a framework to simultaneously account for direct and indirect effects of hypoxia, including their linear and non-linear interactions on key organisms to support ecosystem-based management in the NGOMEX. A battery of modeling approaches of varying complexity (individual – to ecosystem-level), spatial configuration (near-field plume to fine-scale spatial pelagic to entire NGOMEX), and temporal duration (hourly to inter-annual) will be employed to provide both understanding and forecast capabilities to the management community of the NGOMEX. 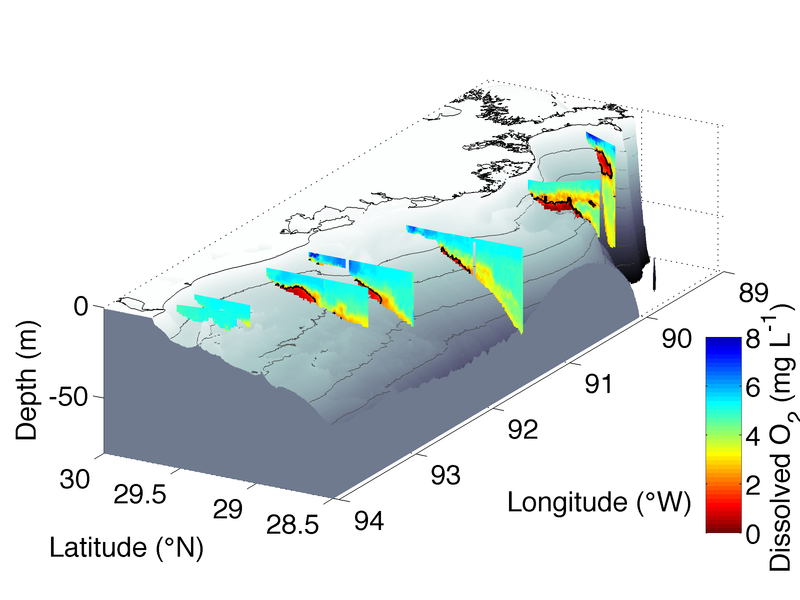 What is the effect of the spatial extent and seasonal timing of hypoxia on fish growth, recruitment and production potential? How will hypoxia affect the spatial distribution and predator-prey interactions of mobile organisms and zooplankton? How does hypoxia affect habitat quality and suitability for economically and ecologically important fishes? How will management decisions on loadings affect fisheries through its impact on the timing and extent of hypoxia? What is the potential of strong wind events (and their relationship to climate change) to re-aerate the water column and alter the interactions of fish and their prey? What are the most effective tools to forecast food-web interactions, habitat suitability, and fish production in relation to hypoxia? 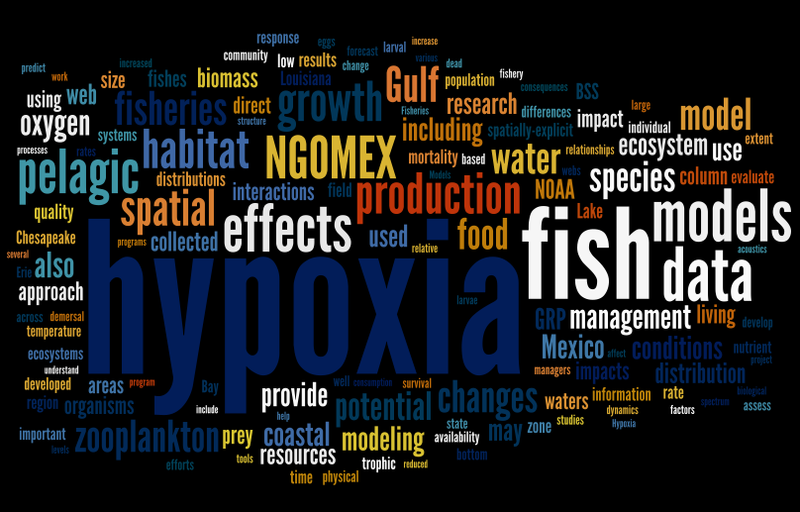 It is hypothesized that hypoxia in the NGOMEX can strongly impact pelagic food webs and production through unexpected, indirect pathways, potentially leading to changes in production potential (both positive and negative) of economically and ecologically important fishes. Our overall goal is to provide quantitative tools to probabilistically forecast the effects of hypoxia on the living resources in the NGOMEX. Direct linkages to fisheries management will ensure continued interaction with, and attention to, the critical management issues. Click the image at left to see a full size version of the word cloud created using text from our proposal at http://www.wordle.net.